Composer Alex Shapiro aligns note after note with the hope that at least a few of them will actually sound good next to each other. Her persistence at this activity, as well as non-fiction music writing, arts advocacy, public speaking, wildlife photography, and the shameless instigation of insufferable puns on Facebook, has led to a happy life. Drawing from a broad musical palette that giddily ignores genre, Alex's acoustic and electroacoustic works are published by Activist Music LLC, performed and broadcast daily, and can be found on nearly thirty commercial releases from record labels around the world. This pretty much sums things up. You can continue reading Alex's story, or click the arrow to cut to the chase. Looking for a short program bio, or press kit? Born in New York City in 1962 and raised in Manhattan, Alex began composing as a much shorter person at age nine. At fifteen, she was encouraged by Leo Edwards in her first private composition lessons during a summer program in 1977 at Mannes College of Music, at which she also had her initial experiences building a modular synthesizer and writing remarkably dreadful electronic music. Alex continued to explore acoustic and synthesized pieces the following two summers of '78 and '79 with Michael Czajkowski and George Tsontakis, as the then youngest and sometimes most poorly behaved composer at the Aspen Music School and Festival. Subsequently, Alex was educated as a composition major at The Juilliard School's Pre-College division from which she graduated in 1980, and at Manhattan School of Music from 1980-1983, where she pursued electronic music with Elias Tanenbaum, was a composition student of Ursula Mamlok and John Corigliano, and from which she did not graduate because after completing three years of study --and with her teachers' blessings-- she moved to Los Angeles when hired by a film producer there to score a documentary. An accomplished pianist, Ms. Shapiro studied for nearly a decade with New York recitalist Marshall Kreisler, and until a moment of supreme klutziness in 2016 for which two of her fingers paid the price, she was an active guitarist as well. Alex also plays very bad flute, an instrument sometimes found in the woodwind section wedged between the alto flute and the bass flute. Shapiro moved to L.A.'s San Fernando Valley in 1983. A few years later, lured by the intoxicating combination of salt air and wildfire smoke, she settled in Malibu, accessorizing her music writing life with reptiles, astronomy, volunteer civil liberties activism, sailing, and a herd of plastic dinosaurs which resided above her kitchen cabinets and kept her company as her cooking ineptitude routinely set off the smoke alarm. Alex composed movie and television scores for the first fifteen years of her career, until the joy of scoring a low-budget feature film with a small orchestra in 1996 reawakened her love of composing chamber music. By the late 1990s, Alex shifted her focus entirely to the concert world, and devised inventive ways to use the still-new internet to let people know about this still-new composer. With the help of her understanding of the music business from having worked in Hollywood, plus her experience as a recording engineer and computer/software geek, as well as her volunteer involvement with music advocacy organizations, Alex's career thrived. And yes, if you happen to be an emerging composer reading this, that last sentence is a great recipe to consider for your own success. 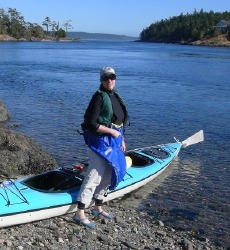 In 2007, established both in person and in pixels, Alex and her plastic dinos traded the traffic and mudslides of southern California for a considerably less dangerous life on Washington State's remote San Juan Island. 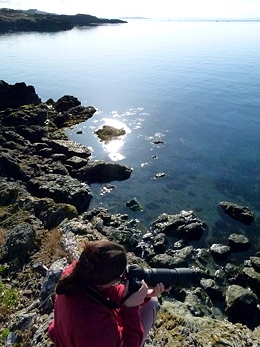 When she's not composing, Alex procrastinates on her next piece by pointing her camera at the surrounding wildlife, resulting in sometimes-even-award-winning images, including one of a myopic Bald Eagle about to collide with her, featured in The Spirit of Flight 2013 exhibit at Seattle's Museum of Flight (a much smaller version of which dangles at the top of this web page). 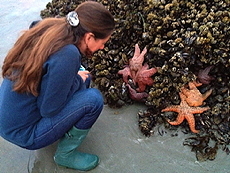 Shapiro's audio and photos fill her blog, Notes from the Kelp, accompanied by her essays on animals, sea life, and human nature, which connect not only Alex's music, but her heart and her [sometimes groan-inducing] sense of humor, to a wide sphere of colleagues and audiences. All right, now that we're up to current, here comes the pithier stuff. Shapiro is a pioneer in the uses of digital media for the promotion of artists' works, and their context within communities. Through interactive social networks and collaborative live, online sessions she calls Skypehearsals, Alex enjoys building relationships with musicians and listeners, preferring to create an affinity for her music by engaging others in their own interests. The author of many articles on new media, in 2009 Shapiro was invited to Washington, D.C., to testify in a Federal Communications Commission hearing about broadband access and digital rights. Firmly believing that the only artist one is in competition with is oneself, Alex co-founded the ASCAP Composer Career Workshop touring series, advising fellow music-makers on ways to benefit from their creative output. Shapiro is a familiar guest lecturer at universities around the United States, where she mentors students not only in music composition, but also in business practices. Alex addresses the philosophy behind a career based on the concepts of kindness, graciousness, and a positive sense of self worth-- topics too rarely discussed in schools. Even more fun than interacting in pixels, is the in-person work Alex gets to do every year. She enjoys the role of composer-in-residence at many colleges and new music festivals, and has given lectures, masterclasses, workshops and one-on-one lessons at universities across the United States, including at Yale University, University of Southern California, The Ohio State University, University of Minnesota, Washington State University, University of Missouri-Kansas City, Manhattan School of Music, Capital University, University of Wyoming, Carthage College, Univeristy of Montana, University of Hawaii (much warmer), and University of Chicago, among many. 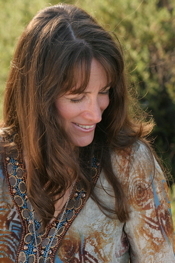 Ms. Shapiro appears regularly as a speaker at a wide variety of music events, which have included NARAS' Grammy® in the Schools, the Los Angeles Philharmonic's First Nights series, IAWM's International Congress of Women in Music, the National Performing Arts Convention in Denver, Colorado, three of the Minnesota Orchestra Composer Institutes, and eleven of ASCAP's I Create Music Expos in Hollywood. Between 2000 and 2010 Alex interviewed over 100 composers as the moderator of the Los Angeles Composer Salon series, and of ACF/LA's Composer to Composer series at Walt Disney Concert Hall. In November 2017, Alex spoke about the future of collective management at the CIAM Annual Congress in Tokyo, Japan, and in June 2018, she addressed gender inequity issues throughout the music industry at the CISAC General Assembly in Warsaw, Poland. Alex returns as a guest clinician at the Midwest Clinic in Chicago, December 2018, and will join a panel of composers and conductors discussing ways to address gender inequities in the concert world. An enthusiastic leader in the new music community, Ms. Shapiro has served as the Symphonic & Concert writer representative on the ASCAP Board of Directors since 2014, and was elected to the Board of Directors of the ASCAP Foundation in 2015. In 2017 Alex became ASCAP's elected representative on the Executive Committee of The International Council Of Music Authors (CIAM)— the writers council of CISAC, a global network of authors' societies that represents four million creators in 121 countries. Alex also co-chairs ASCAP's Symphony & Concert Committee and its Marketing Committee. In late 2016, Shapiro was elected to the Board of Directors of The Aaron Copland Fund for Music. Shapiro is the past President of the Board of Directors of the American Composers Forum of Los Angeles, and former Co-chair of the Program Council for New Music USA. Alex has been a board member of U.S. music organizations including The American Music Center, The MacDowell Colony, The College Music Society, NACUSA, and The Society of Composers & Lyricists, of which she was Vice president. Shapiro's volunteer activism extends beyond the music world to that of civil liberties, and includes three elected terms in the 1990s to the Board of Directors of the ACLU of Southern California. During her film composing days, she served as Vice President of the 30,000-member affiliate, chaired its State and National Legislative Action Committee, and received the ACLU’s 1993 Chapter Activist of the Year award. 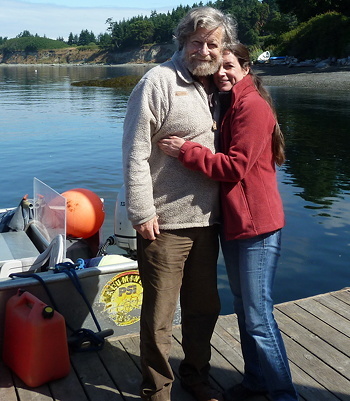 Alex is currently a Board member of the University of Washington's Friday Harbor Laboratories, a marine science research facility whose mission reflects much of what inspires Shapiro's music. Alex's concert music is a diverse collection spanning from chamber groups to large ensembles, and from purely acoustic pieces to works that pair musicians with prerecorded digital audio. Train of Thought, Shapiro's 2015 electroacoustic sextet for low winds for the Cochran Chamber Commissioning Project, has been adapted for full wind band in an iteration titled Trains of Thought, and its multiple premieres by participating symphonic wind ensembles across the U.S. began March 2018. The spring of 2016 included a whirlwind of 4 premieres, 23 commissioners, and over 70 live performances of Alex's pieces between March and May, including Alex's 2016 electroacoustic concert wind band works Moment, commissioned by a consortium of 18 ensembles across the United States, and Rock Music, for Patrick Marsh Middle School in Wisconsin. Shapiro's latest solo piano work, Arcana, is a 25-minute suite that was premiered in March 2016 by its commissioner, pianist Michael Tierra, who also commissioned and premiered a striking new electroacoustic version titled Arcana Planet, in March 2017. Other electroacoustic additions to Alex's catalog include the 2015 multimedia symphonic band work Lights Out, commissioned by a consortium of 19 high schools and colleges across the U.S., and Kettle Brew, for timpani, mixed percussion and electronics on which she collaborated with percussionist David Jarvis, who premiered the piece during Shapiro's February 2013 residency as guest composer for Washington State University's Festival of Contemporary Art Music. Tight Squeeze is an uptempo, 12-tone Afro-Cuban techno bebop electroacoustic wind band work (that's right), which was premiered in February 2013 by conductor Miller Asbill at Brevard College, one of the piece's commissioning partners. Alex's 2014 electroacoustic symphonic wind band work, Liquid Compass, explores the balance between the mysterious and the noble, commissioned and premiered by conductor James Ripley and Carthage College to commemorate the school's 140th anniversary. 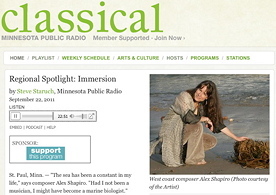 Other notable premieres include Alex's 2011 suite for electroacoustic symphonic wind band titled Immersion for a consortium of universities led by the University of Minnesota and broadcast nationally on Minnesota Public Radio. A 2012 acoustic sextet for strings, winds and piano titled Perpetual Spark was commissioned and performed by Chicago's Fifth House Ensemble, which recorded the piece September 2013 for their 2014 CD titled, Excelsior, on Cedille Records produced by Judith Sherman. Another mixed piano sextet, Unabashedly More, was premiered in 2011 at Carnegie Hall by the New York ensemble Lunatics at Large, and pianist Teresa McCollough premiered Ms. Shapiro's solo piano work, Spark, in November 2011 at Roulette in New York City. Among the most widely performed of Ms. Shapiro's works has been Paper Cut, for wind band, prerecorded electronics and printer paper, commissioned in 2010 by the American Composers Forum's BandQuest program and the National Endowment for the Arts. While frequently performed by colleges, Paper Cut is the very first electroacoustic work written specifically for the middle- and high school wind band repertoire. Nearly 100 creative videos of performances using black light, dance, and other visuals can be found on YouTube, from concerts all over the globe. Shapiro is the author of a chapter in the 2013 GIA Publications book, Musicianship: Composing in Band and Orchestra, and both Paper Cut, and Tight Squeeze, are featured in the field's best known book/CD series, Teaching Music Through Performance in Band, Volume 10, edited by Eugene Migliaro Corporon and released by GIA Publications December 2014. Both pieces were performed at the Midwest Clinic International Band and Orchestra Conference in Chicago in 2011 and 2013, by the VanderCook College of Music Symphonic Band. Ms. Shapiro was a guest clinician presenting workshops on electroacoustic music and inventive uses of new media at the 2013 Midwest Clinic in Chicago, and the 2014 Texas Music Educators Association in San Antonio, and in July 2016 she was the featured guest composer for the University of British Columbia's Wind Conducting Symposium. 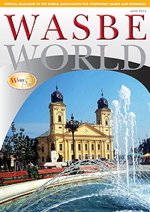 Alex's in-depth articles on the topic were published in the June and September 2014 issues of WASBE World, the magazine of the World Association for Symphonic Bands and Ensembles, and she regulary gives workshops on the topic using vivid multimedia presentations that bring the concepts to life. Ms. Shapiro has been deemed "one of the most noteworthy composers for the 21st century wind band" by Carthage College and Dr. James Ripley upon the May 2014 premiere of her electroacoustic tone poem for symphonic band, Liquid Compass, composed in honor of that ensemble's 140th anniversary. She is the recipient of national honors and recognitions including those from the American Music Center, ASCAP, the American Composers Forum, and Meet the Composer, and has been awarded artist fellowships from The California Arts Council and The MacDowell Colony. 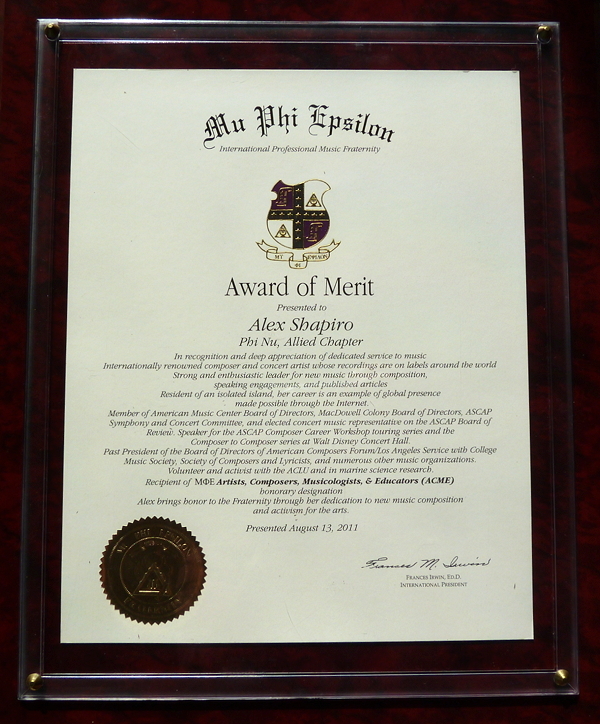 In 2011, Ms. Shapiro was honored by the international music fraternity Mu Phi Epsilon, and presented its highest distinction given to members, the Award of Merit, for her innovative use of new technologies in developing her composing career and helping colleagues do the same. 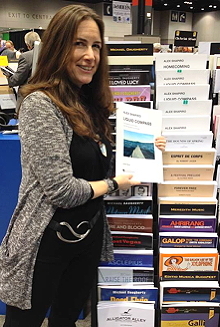 In 2013, Hal Leonard Corporation signed what they call a “groundbreaking, pioneering” exclusive print and digital distribution deal with Activist Music for Ms. Shapiro's symphonic wind band pieces and other larger works from her catalog. Alex speaks at many events and motivates people in and outside of the music world. Whether discussing the philosophy of self worth or the importance of a sense of humor, Alex is an engaging presenter who's been referred to by more than a few people as "the female Anthony Robbins of contemporary music, just a lot shorter." Alex's career is multi-dimensional, encompassing composing, speaking, and writing, as well as a great deal of community involvement. Oh, and a lot of nature photography that can be seen throughout this website, and on her blog, Notes from the Kelp. Keep scrolling through this page to see what keeps her busy. The most important imformation in a composer's bio is what her or his music SOUNDS like! Alex calls herself a pan-genre composer, with a penchant for organically spanning across idioms, often within a single piece. Click around these mp3s below, for fun. Why just read a bio about someone when you can hear what they have to say? Click to watch or listen to Alex on any of these broadcasts and podcasts. 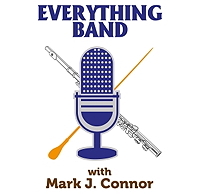 The latest broadcast, March 2018: Alex really enjoyed talking with Mark J. Connor as a guest on his popular podcast, Everything Band. Covering everything from career to clarinet-playing gerbils (! ), it was a far-ranging chat! Click the icon at right to have a listen. Alex's essays on the new digital paradigm, the internet, free speech and the meaning of net neutrality to all artists, have been read on classical music blogs and magazines like Sandow, Mind the Gap, Adaptistration, Tokafi, and NewMusicBox. 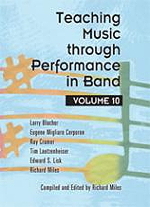 Two of Alex's electroacoustic wind band pieces for high school musicians, TIGHT SQUEEZE, and PAPER CUT, are featured in the book/CD series, Teaching Music Through Performance in Band, Volume 10, edited by Eugene Migliaro Corporon and released by GIA Publications December 2014. Alex's life and approach to her music career are the subject of autobiographical articles and interviews, including the spring 2005 issue of the Journal for International Alliance for Women in Music, the autumn 2005 and winter 2006 issues of The American Composers Forum magazine, Sounding Board, the June 2008 issue of Chamber Music, the October 2010 issue of 21st Century Music, and the November 2011 article for Composers & Schools in Concert. Many albums are currently available which feature Alex Shapiro's works, and there are new recordings coming out in the next year from a variety of artists. 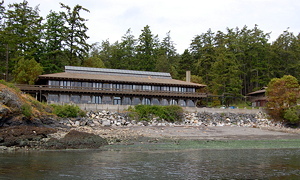 Alex's own CD of several of her favorite chamber works, Notes From the Kelp, was released October 2007 on Innova Recordings and is in its second pressing. April 29, 2015: Commissioned by a consortium of 19 high schools and colleges across the U.S., LIGHTS OUT may be the first truly multimedia band piece, in which the visuals were composed into the score. Playing it in the dark is preferred! Click here to read more about this adventurous piece which looks as cool as it sounds. 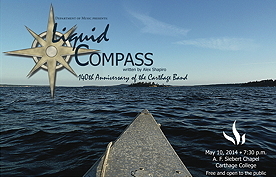 May 10, 2014: Commissioned by Carthage College to commemorate its 140th anniversary, LIQUID COMPASS is a tone poem about a journey that spans the mystical and the triumphant. The piece migrates to many places, but never loses its bearings in pursuit of a musical true north. Click here to read more about this watery piece. February 13, 2013: If Arnold Schoenberg, Henry Mancini, and Charlie Parker ever walked into a techno dance club in Havana, TIGHT SQUEEZE is what it might have sounded like. Alex's electroacoustic wind band piece was premiered at Brevard College with conductor Miller Asbill, with additional consortium premieres around the U.S. in 2013 and 2014. 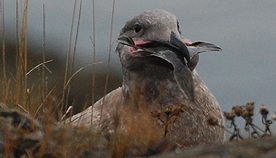 Click here to read about the piece, and to see more weird photos of a young gull attempting to swallow his lunch. February, 2012: Alex's chamber sextet, PERPETUAL SPARK, has been heard in many Chicago-area concerts throughout 2012 and 2013, performed by familiar partners to her musical crimes, Fifth House Ensemble, who recorded the piece in September 2013 for their 2014 CD on Cedille Records, Excelsior, produced by Judith Sherman. Dedicated to the late Mara Bershad, this piece for flute/piccolo, violin, viola, cello, double bass and piano, originally came to life as SPARK for solo piano, premiered by Teresa McCollough at Roulette in New York City in November 2011. March 21, 2011: The New York ensemble Lunatics at Large premiered Alex's chamber sextet, UNABASHEDLY MORE, for flute/piccolo, clarinet, violin, viola, cello and piano at Carnegie Hall, as part of the ensemble's Sanctuary Project, which paired composers and poets collaborating on new works. Click here to listen to the premiere of IMMERSION! February 16, 2011: Alex's electroacoustic symphony for winds and percussion, IMMERSION, was beautifully premiered by conductor Jerry Luckhardt and the University of Minnesota Symphonic Band, and broadcast nationally from Minnesota Public Radio. Alex Shapiro's concert scores are published by her company Activist Music LLC and are directly available through the Purchase page of this website. Much of the Activist Music catalog is available through J.W. Pepper and Son, Inc. and Theodore Front Musical Literature, Inc., and many works in her catalog are also distributed by Harrassowitz, and Hickey's Music Online Ms. Shapiro is pleased to welcome the Hal Leonard Corporation as the exclusive distributor of her symphonic wind band works, as well as other larger ensemble pieces in the Activist Music LLC catalog. Ms. Shapiro's woodwind music can be found at Just for Winds, and her music for double reeds is also sold through TrevCo Varner Music. Shapiro's flute music is also available through Flute World, and Carolyn Nussbaum Music Company, and her brass music can also be ordered from Just for Brass, and BVD Press. Ms. Shapiro's percussion music can be found at Steve Weiss Music. The name Activist Music originates from Ms. Shapiro's belief that all people must be encouraged to raise their voices, articulate their principles and do what they can to affect change around them, whether in politics, within their own neighborhoods, or through the art which they share with others. 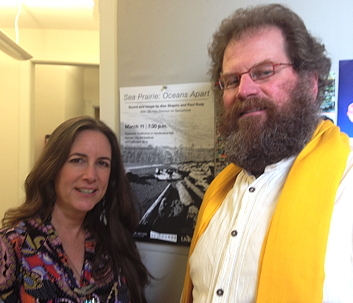 Alex with composer Joan Huang during an ACF/LA Composer's Salon. 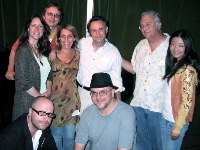 Alex (left), with 2007 Composer Salon participants (clockwise from top): Gernot Wolfgang, Giovanna Imbesi, Michael Roth, Randy Newman, Bei Bei He, Kubi Uner (seated) and Drew Schnurr. In February 2014, Alex was elected by ASCAP's Board of Directors to fill the Symphonic & Concert seat previously held for over twenty years by the late Stephen Paulus. She was re-elected by ASCAP's general membership in March 2015. In November 2017 Alex became ASCAP's elected representative on the Executive Committee of The International Council Of Music Authors (CIAM)— the writers council of CISAC, a global network of authors' societies that represents four million creators in 121 countries. Ms. Shapiro was elected to the Board of Directors of The Aaron Copland Fund for Music in November 2016. Previously, she served on the Board of Directors of the American Music Center when it merged in 2011 with Meet the Composer and became New Music USA, for which she served as Chairperson of its Media Council until 2015. From 2010-2013 Alex served on the Board of Directors of The MacDowell Colony, and she is the past President of the Board of Directors of the American Composers Forum of Los Angeles, and past Chairperson of the ACF/LA Advisory Council. Between 2000 and 2010 Alex was the Moderator of ACF's popular Composer's Salon series, as well as its Composer to Composer series held at Walt Disney Concert Hall. She has served as an officer of The National Association of Composers, USA (NACUSA) and as an officer of the Pacific Southern Chapter of The College Music Society. 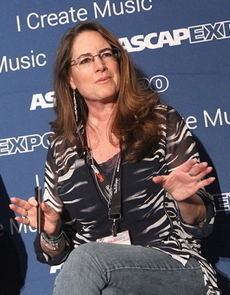 In 1997 Shapiro co-chaired a committee for ASCAP to develop composers' contract standards for negotiations for the use of original music over the internet, and she is currently co-chair of ASCAP's Symphonic & Concert Committee. 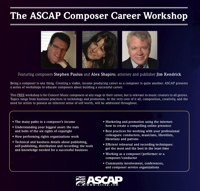 In 2009, with fellow committee members composers Stephen Paulus, Jennifer Higdon, and attorney and EAM/Schott Music president Jim Kendrick, Alex founded a U.S. touring series of music business seminars titled, The ASCAP Composer Career Workshop. From 2010-2014, Alex served as the elected national concert music composer representative on the ASCAP Board of Review. From 2003 to 2007, Alex served on the Advisory Board for the Los Angeles City College Music Department, and she is a longtime member of the Alumni Council of Manhattan School of Music. In 1994 Ms. Shapiro joined the Board of Directors of The Society of Composers & Lyricists, the professional association of film music artists, and served three terms from 1994-2000, including two years as the organization's Vice president. Alex extended her efforts with The Society of Composers & Lyricists in her role as the Chairperson of the 1996-1999 Film & TV Music Conferences, co-presented in Los Angeles at The Directors Guild of America by the SCL and The Hollywood Reporter. 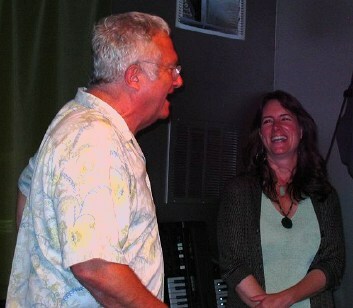 Alex with musical theater artist Steve Schalchlin during an ACF/LA Composer's Salon. Alex chaired the Public Relations Committee for Women in Film's 1993 Crystal Awards, honoring Jack Lemmon and Julie Andrews, and has volunteered her time to many arts and music organizations in Los Angeles. at Tuttomedia Studios in Venice, CA. where they performed a house concert. 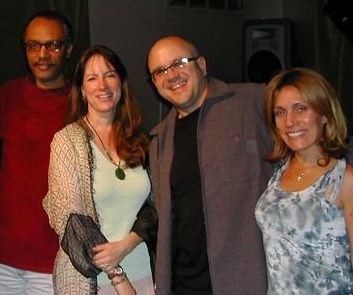 at the July 2007 Composers Salon which Alex moderated in Venice, CA. during Alex's residency at UMKC School of Music. An engaging public speaker with an unusually broad range of experience, Alex has moderated panels for countless seminars. She's a familiar face to audiences at The Society of Composers & Lyricists, and The American Composers Forum, for which she has interviewed over 100 composers including Steven Stucky, Randy Newman, Mort Subotnick, Anne LeBaron, Mark Watters, Bruce Broughton, Vinny Golia, David Newman, Joan Huang, Stephen Paulus, John Steinmetz, Bear McCreary, Morten Lauridsen, and Bill Kraft for the Los Angeles Composers Salon series. Additionally, Alex has also conducted American Composer Forum Composer to Composer interviews at Walt Disney Concert Hall and other Los Angeles venues with guests as diverse as Steve Reich, Gavin Bryars, Christopher Rouse, Don Davis and Billy Childs. Alex was the Keynote Speaker at the October 2006 Society of Composers, Inc. National Student Conference, and represented musicians on a panel she also moderated in June 2008 at the enormous National Performing Arts Convention in Denver, CO, at the Colorado Convention Center. 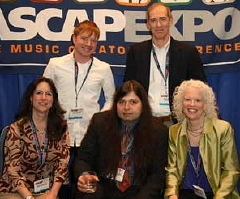 Alex on a 2008 ASCAP EXPO panel with John Mackey, Doug Wood, upper row, and Frank J. Oteri and Martha Mooke, lower. 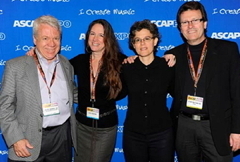 Alex gave a 2011 ASCAP EXPO Composer Career Workshop with ASCAP boardmembers Jim Kendrick and Stephen Paulus, standing with ASCAP's Concert Music Dept. Asst. VP Cia Toscanini. and ASCAP VP of Concert Music, Cia Toscanini. 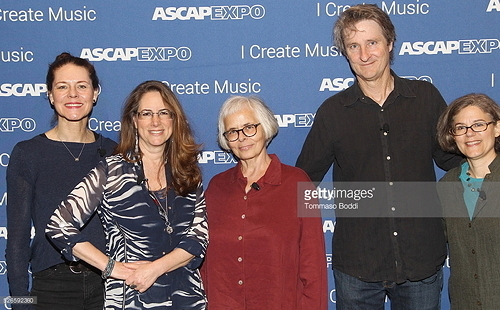 Alex speaking at the 2017 ASCAP EXPO in Hollywood, on a panel tited, "Getting Credit Where Credit is Due." songwriter and ASCAP Board member Desmond Child, Auddly founder Niclas Molinder, and Alex. 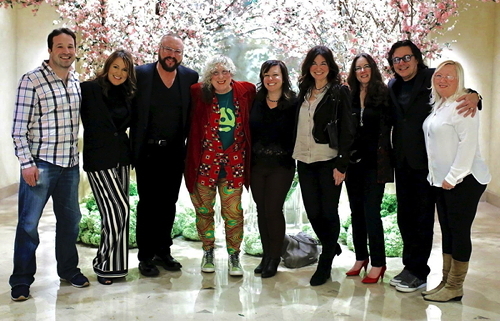 Allee Willis, Michelle Lewis, Shelley Peiken, Alex Shapiro, Rudy Perez, and Betsy Perez. Among the panel discussions Alex has led for the SCL are The Virtuoso Soloist in Film Music, presented on the scoring stage of 20th Century Fox Studios in 2000 and featuring violinist Joshua Bell (The Red Violin), pianist Ralph Grierson (E.T. ), and bagpiper Eric Rigler (Titanic), and the 2004 seminar, Launching Your Film Scoring Career. On the topic of new technologies, Alex moderated a session for the 2004 Music Business Chops seminar in Los Angeles, with industry leaders including CD Baby founder Derek Sivers, Tony van Veen of Disc Makers, and Jim Griffin of Cherry Lane Digital. In 2004 Alex appeared on stage at Walt Disney Concert Hall with conductor Esa-Pekka Salonen and the Los Angeles Philharmonic to co-host the sold-out premiere of Steven Stucky's Pulitzer prize-winning work, Second Concerto for Orchestra, for the L.A. Phil's First Nights series. 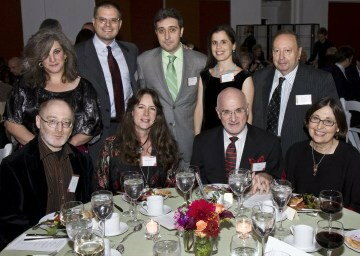 In January 2006 and again in January 2009, Ms. Shapiro was a panel speaker for the Chamber Music America Conference in New York City. In February 2006 she was the moderator for an evening of composer Chen Yi's works at the New Music Festival at Santa Clara University. Alex is an especially familiar speaker on the uses of digital media for the promotion of artists' careers. She has been a featured speaker at nine of the ASCAP EXPOs in Hollywood, the 2009, 2010 and 2012 Minnesota Orchestra Composer Institutes, the American Composer Forum's Making Music Work series at McNally-Smith College, NETMCDO (Network of Music Career Development Officers), two of Chamber Music America's national conferences in New York City, the National Performing Arts Convention in Denver, and around the U.S. at the ASCAP Composer Career Workshops, of which she is a co-founder. 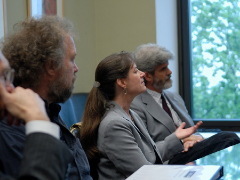 In 2009 Alex was invited to testify to the FCC in Washington, D.C. in a public hearing on broadband access and priacy issues. Alex has been a lively guest on numerous radio and podcast shows. 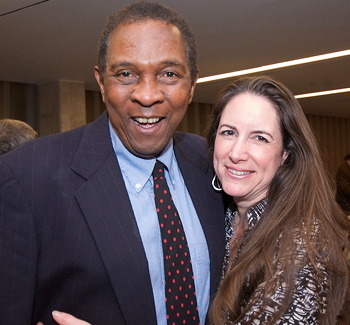 She was heard in May 2014 on Wisconsin Public Radio's Morning Show with Gregory Berg, discussing her work along with fellow guest conductor James Ripley, who premiered LIQUID COMPASS the following night. In July 2012 Swedish Radio host Birgitta Tollan interviewed Alex in New York City, and in February 2012 Alex was a guest on Marvin Rosen's Classical Discoveries show on Princeton Univeristy's WPRB-FM, in a three hour interview during which seven of her works were broadcast. Other appearances include Los Angeles' KPFK-FM's For the Record with Samm Brown, Music of the Americas with Jeannie Pool, the KXLU-FM Los Angeles program, Trilogy, and The Audition Booth with Martin Perlich on KCSN-FM, as well as WGDR-FM's Kalvos & Damian's New Music Bazaar. An interview Alex gave producer Steven Rosenfeld of Behind the Beat appears on the ASCAP Audio Profiles page, and her interview with John Clare for the WITF-FM radio show Composing Thoughts aired in 2008. The virtual world is an active arena as well, and Alex has been the February 2008 and May 2009 guest on the Second Life Cable Network talk show for Music Academy Online. 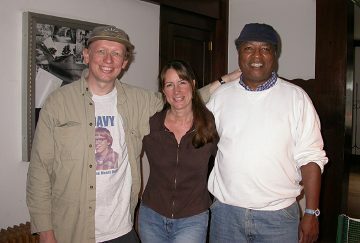 Alex's life and music were the subject of a one-hour interview on a 2006 radio series called American MusicMakers produced by Theme and Variations host Will Everett, airing on over 70 public radio stations across the U.S. She has also been the featured guest on Los Angeles major market syndicated shows on KFI 640 and KABC 790 AM radio. Her interview for the American Composers Forum series, Measure for Measure, was the inaugural August 2006 broadcast for the new podcast program. 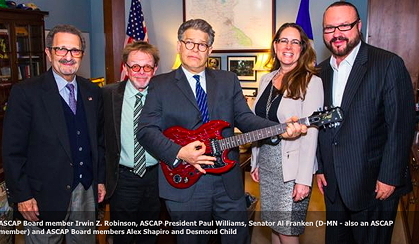 Each spring, members of the Board of Directors of ASCAP and creators who are strong copyright advocates visit Senators, members of Congress, and their aides, to keep the message of fair compensation for music creators front and center. 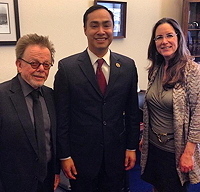 In 2016 and 2015, the Songwriter Equity Act was at the core of ASCAP's discussions on Capitol Hill. May 2016: Standing on the Speaker's Balcony in the Capitol Building. 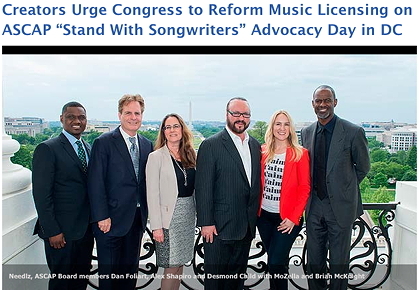 L-R: Needlz, ASCAP writer Board members Dan Foliart, Alex and Desmond Child, MoZella, and Brian McKnight. May 2016: Meeting with Senator Al Franken (D-MN). 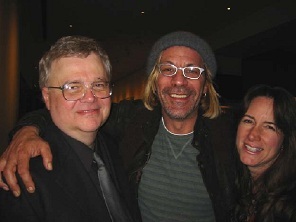 L-R: ASCAP publisher Board member Irwin Z. Robinson, ASCAP writer and Board President Paul Williams, Alex, and ASCAP writer Board member Desmond Child. 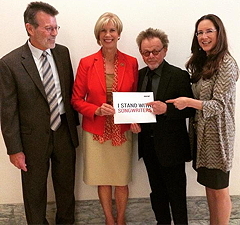 May 2015: Alex with Janice Hahn (D-CA) and Joaquin Castro (D-TX), with ASCAP board member and composer Richard Bellis and ASCAP board President and Chairman Paul Williams. 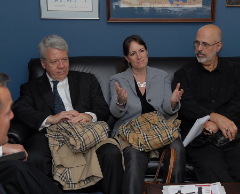 In 2009, Shapiro joined fellow ASCAP members on Capitol Hill to meet with numerous senators and congresspeople in an effort to ensure audio visual download rights. 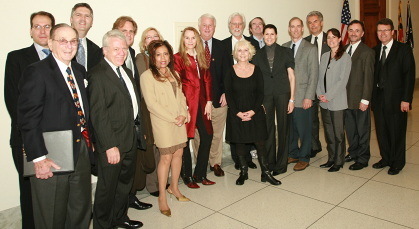 with ASCAP board members and staff. and to Representative Steve Cohen (D-TN) in their offices. Shapiro was the sole artist testifying on an FCC panel hearing in 2009 about broadband access. Her career has become representative of the way the internet and digital technology have given anyone with a computer the ability to create a global presence. and Kathy Garmezy, assistant executive director of the Directors Guild of America. The following week, FCC Chairman Julius Genachowski quoted Alex's testimony in his keynote address at the Future of Music Coalition Policy Summit in D.C.
C-SPAN broadcast of Alex testifying at the FCC in Washington, D.C., September 2009. "Now, why is the adoption of fair rules of the road -- Net Neutrality rules -- so important? Well, the artists, songwriters, and independent producers in the music industry know better than most. For example, at a recent public workshop held at the FCC we heard Alex Shapiro who discussed how the Internet allows her to manage her career even from rural Washington State. 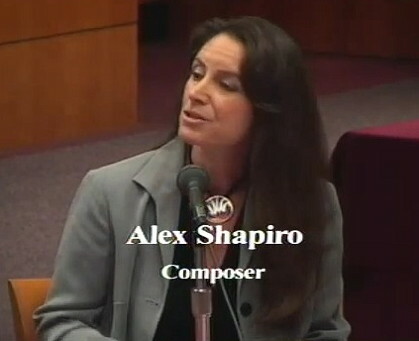 Let me read from her testimony: "My name is Alex Shapiro, and I'm a composer. My use of the Internet has significantly shaped the evolution of my career, and has allowed me to reach audiences around the world, obtain commissions, and sell recordings and scores -- all from a fairly isolated outpost on a bridge-less island in Washington State." Her point is an essential one. You don't have to be Bruce Springsteen to reach your audience on the Internet. You can be an independent artist on an island -- whether literal or musical -- and reach everyone who has an Internet connection." 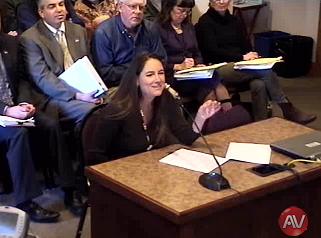 Alex's activism is on the local level, as well: in February 2012 she appeared before the joint meeting of the San Juan County Council and the Planning Commission, to speak on behalf of the vital need for high speed broadband access for all of the San Juan Islands. 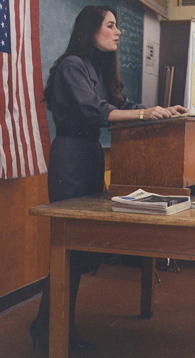 Alex delivering a speech in 1993 as ACLU/SC Vice president. Along with her involvement in the music industry, Ms. Shapiro has distinguished herself in an additional area of passionate pursuit civil liberties. 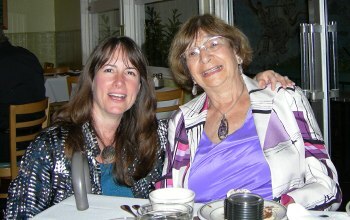 She served on the Board of Directors of the American Civil Liberties Union of Southern California from 1990 to 1996; as Vice President of the nation's largest, 30,000 member affiliate, Ms. Shapiro frequently appeared on radio and television broadcasts as a spokesperson for a wide variety of individual and artistic freedoms. 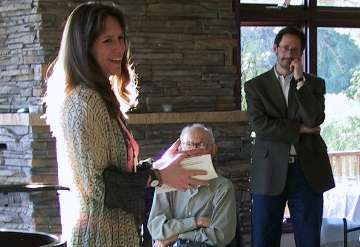 In her capacity as the Chairperson of the ACLU/SC's State and National Legislation Committee, Alex produced three Conferences that brought State senators, Assembly members, clergy and community leaders together for day-long seminars to openly debate current issues, often related to the same free speech and First Amendment rights upon which all artists rely. Alex is the recipient of three awards from the ACLU honoring her activism, including being named the 1993 Chapter Activist of the Year. on Waldron Island, WA, July 2011.
in Santa Barbara, CA, June 2006. May 2011 (Photo by Norberto Valle). 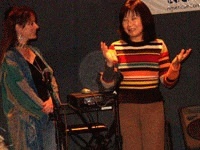 as she spoke at the March 2004 ACF/Los Angeles Music Room. 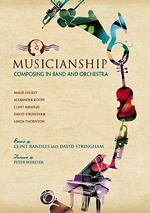 Alex is the author of Releasing a Student's Inner Composer, one of the chapters in the 2013 book, Musicianship: Composing in Band and Orchestra, published by GIA Publications. 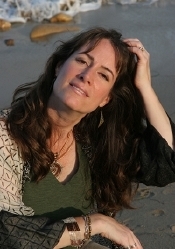 She is the featured composer in the ten-page autobiographical lead article, Compose, Communicate and Connect for the Journal of the International Alliance for Women in Music, Spring 2005 issue. Widely praised for its candor, the article was reprinted in two parts in the Autumn 2005 and Winter 2006 issues of the magazine of the American Composers Forum, Sounding Board. Alex has written an extensive two-part article on the subject of her clinic presentations on new media in the band world. 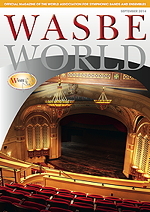 The 8,000 word essay, titled The e-Frontier: Music, Multimedia, Education, and Audiences in the Digital World, appears in the June and September 2014 issues of the magazine of the World Association for Symphonic Bands and Ensembles, WASBE World. Shapiro has been a regular contributor to The Society of Composers & Lyricists' award-winning publication, The Score, and is the author of several columns on composers and new technology, including the journal's cover article entitled Multimedia: You Can Get There From Here. She has also been a recurring essayist for the online magazine, New Music Box in an exploration of new music and the labels of neo-romanticism, and on the subjects of artists and self worth, and using the web to create income. In addition to articles on music business and technology for publications ranging from New Music Box to the newsletter for American Express cardholders, Alex has been a familiar presence on the Sequenza 21 web blog, winner of the 2005 ASCAP Deems Taylor Internet Award. To read Alex's essays on music, nature and her humorous musings about life in general, click here. 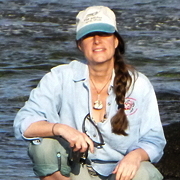 Alex is also the author of the photosonic blog, Notes from the Kelp, which pairs her wildlife photographs with audio clips of her music each week, offering a personal view into her unique island environment. In April 2006 Alex was invited to contribute to a set of guest essays about bringing new listeners to the symphony, on Drew McManus' widely read orchestra management blog, Adaptistration. Her essay and many others appear in the collection, Take a Friend to the Orchestra. Shapiro has been profiled in numerous articles and interviews, including being featured in Kyle Gann's American Composer series in the May/June 2008 issue of Chamber Music magazine. Other pieces about her life and work have appeared in New Music Forum, Sigma Alpha Iota's Pan Pipes, Mu Phi Epsilon's Triangle, and NACUSA's Composer/USA, as well as in publications spanning from the Malibu Surfside News to Great Britain's Music & Vision Magazine. She has been featured in articles on working composers in two Film & TV Music Special Issues of The Hollywood Reporter, in the Journal of the International Alliance for Women in Music and in issues of the American Composers Forum magazine, Sounding Board. The online magazine, Tokafi, has featured Alex twice in wide-ranging interviews for its August 2006 and March 2008 issues, and Alex was the August 2006 featured composer for the professional music network, My Auditions Alex is the March 2016 guest on Garrett Hope's Composer on Fire podcast series. Alex's life and music have been the subject of several doctoral dissertations, including a 2016 publication by Dr. Elizabeth Etnoyer devoted to Shapiro's keyboard works. 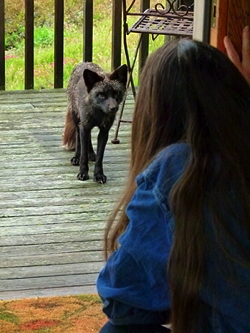 at the MacDowell Colony in Peterborough, New Hampshire, September 2003.
at sea in the San Juan Islands, August 2007. Salvatore Di Vittorio, Santa Maria Pecoraro, and Arkady Aronov. 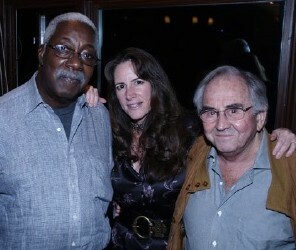 Alex with Los Angeles composers Barry Schrader and Peter Grenader, February 2006. 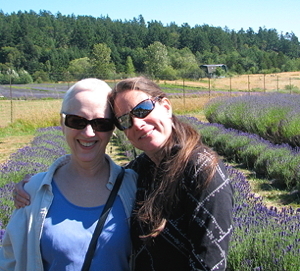 Alex in the lavender fields of San Juan Island with composer Anne LeBaron, July 2011. 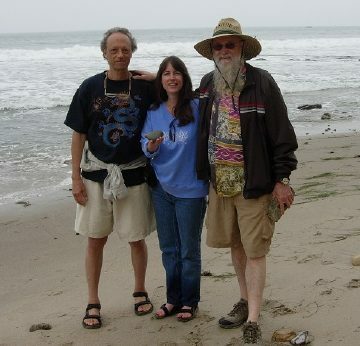 Alex with the late bassist/composer Jimmy Bond and percussionist/composer Bill Kraft in Los Angeles, August 2006. 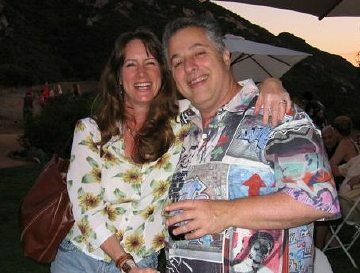 Alex Shapiro worked for fifteen years in the commercial music world, scoring feature films, television shows, commercials and documentaries. in Los Angeles, September 2005.
when she's not in her studio. 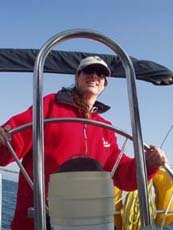 As a certified sailor, a sea kayaker and an avid tide-pooler, Alex's daily life reflects her love of marine biology. 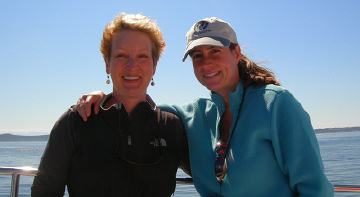 In 2008 she was honored to join the Advancement Board of the renowned University of Washington Friday Harbor Laboratories. The ocean is a significant part of Alex's life, and if Alex wasn't a musician, she'd probably be a marine biologist. Click above for local information about this beautiful environment which inspires her music. Other than nature photography, how else does Alex spend her time? In addition to being a sailor, she loves kayaking and used to be an avid downhill skier until she accepted that gravity is not just a concept, it's a law. Alex tries to balance her music life with her love of the outdoors and the intoxicating scent of SPF 50 sunscreen.For more local photos, and Alex's observations about music and everything that inspires it, visit Alex's blog, Notes from the Kelp. and in the social networks. Looking for additional diverse composers? Please visit the PROGRAMMING RESOURCES page on this site: an inspiring list of aggregated links to a great many talented composers who happen to be women, and/or people of color. Then, share the link with conductors, educators and music-makers!